Bangkok enjoys a tropical climate which means it’s warm year around and can also be humid and rainy. Find out when the best time to visit Bangkok is. If you’re planning a trip to Bangkok, make sure you’re aware of the weather and any events that might take place while you’re there. Bangkok might not have seasons in the same way the non-tropical world does, but some months are still far more enjoyable than others. Extreme heat and humidity and a long rainy season mean that some months are better for visiting Bangkok than others. The best time to visit Bangkok is between November and February. This is Thailand’s cool season, with daytime temperatures slightly under 30°C and relatively low humidity. This is also Thailand’s peak season for tourism, which means prices are slightly higher overall. 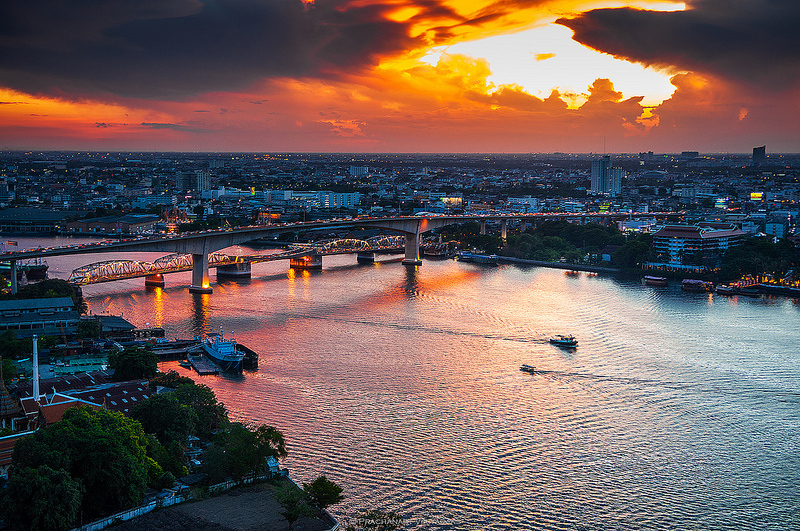 While November to February might be the best time of year to visit Bangkok, you’ll still have a good time in the city at any other time of year. There’s no “winter” in Bangkok like there is in a cooler country, so you’ll never need to pack a coat. Bangkok’s hottest months are from March until late June. In this period, daytime temperatures can reach 35-40°C and humidity can be extremely high. Expect to sweat if you visit during this time of year and pack some cool, comfortable clothing. 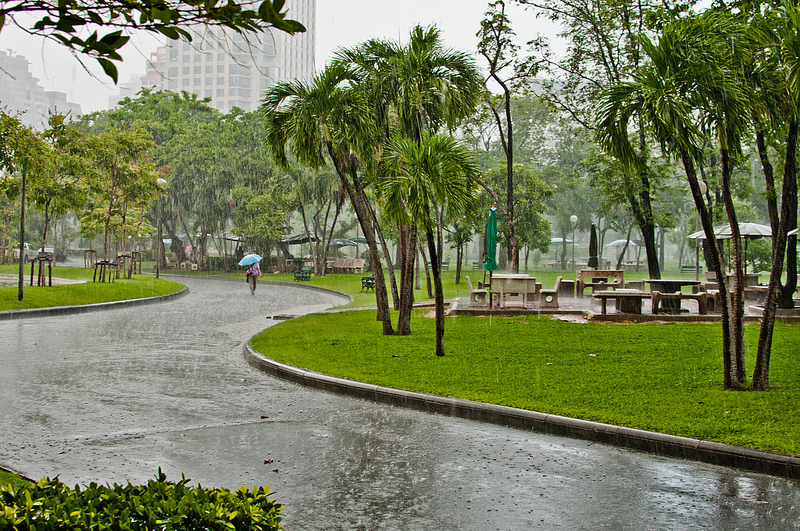 Bangkok’s rainy season lasts from July until October. Although some people expect relentless all-day rain, the rainy season is usually a mix of drab, overcast weather and rainstorms in the late afternoon. When it’s not raining, it’s still easy to enjoy Bangkok’s sights and attractions. You’ll get the best value for money by visiting Bangkok during the rainy season, when hotel rooms are marked down significantly. You’ll pay the most to visit Bangkok from November until February, when hotel bookings and prices are at their highest. There are several major holidays that take place in Bangkok throughout the year, from the Chinese New Year to Songkran. Read on to find out when Bangkok’s major events occur so you can plan your trip to coincide with or avoid major holiday dates. January is one of Bangkok’s most pleasant months. Daily mean temperatures hover around 27°C with very little rainfall. At this time of year, average humidity is a high but manageable 68%. January is Bangkok’s sunniest month with a mean 272.8 monthly sunlight hours. February is another pleasant and comfortable month for Bangkok. Temperatures are slightly higher than in January, with a daily mean temperature of 28.9°C. Humidity averages 72 per cent. February is Bangkok’s fourth sunniest month with a mean 251.4 monthly sunlight hours. Chinese New Year usually occurs in early February (although it can sometimes fall in late January) and Bangkok’s large ethnic Chinese population makes it a fun place to celebrate. Yaowarat, Bangkok’s Chinatown, is the best place to celebrate Chinese New Year. Weather in Bangkok starts to get warmer in March. The mean daily temperature in March is 30.1°C, with 72% humidity. With 269.7 mean monthly sunshine hours and an average of just three rainy days, March is a hot and sunny month in Bangkok. April is Bangkok’s hottest month. The mean daily temperature is 31.2°C, with highs of up to 40.2°C on record. Since Bangkok isn’t significantly cooler at night, nighttime temperatures in April can almost match daytime levels. Pack light clothing if you’re visiting Bangkok in April. Although April technically isn’t part of Bangkok’s rainy season, it’s the first month in which the rain picks up significantly. There are an average of six rainy days in April, up from three days in February and March. Songkran, the Thai New Year, takes place in April. This three-day festival turns the entire city into a large water fight, especially in busy areas such as Silom and Khao San Road. 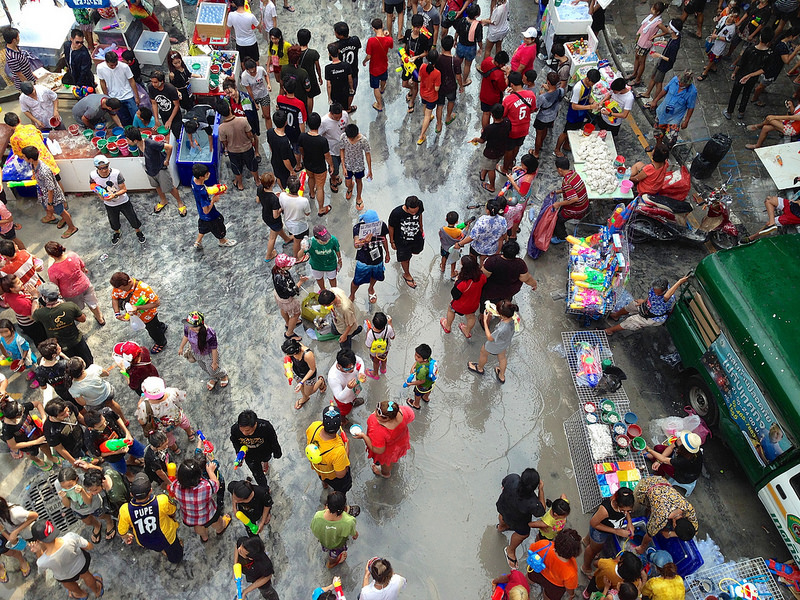 If you’re visiting Bangkok during Songkran, expect to get wet if you spend time out in public. May is another hot month in Bangkok, with daily mean temperatures of 30.5°C, average highs of 34.4°C and record highs of 39.7°C. Humidity and rainfall pick up in May, with an average of 16 rainy days and 75% humidity. May marks the beginning of Thailand’s rice growing season. The Royal Ploughing Ceremony is held in Bangkok at some point in May — the date is chosen based on lunar cycles — to give the country’s farmers a profitable harvest. In June, temperatures decline and rainfall increases, with a daily mean temperature of 29.9°C and just 177 mean monthly sunshine hours. Bangkok experiences 16 rainy days on average in June, making it the beginning, although not officially, of the rainy season. Mean daily temperatures of 29.5°C and average highs of 33.2°C make July a warm and rainy month in Bangkok. As the official beginning of Bangkok’s rainy season, July brings with it 18 rainy days and 175.1mm of precipitation, on average. Temperatures decline and rainfall increases even further in August, with a mean temperature of 29.2°C and 219.3mm of precipitation. Bangkok has 20 rainy days in August, making it one of the year’s rainiest months. September is the peak month of Bangkok’s rainy season. Mean daily temperatures drop to 28.9°C and an average of 334.3mm of precipitation falls on the city. Bangkok has 21 rainy days and just 156 hours of sunshine during September. October is Bangkok’s second rainiest month, with 292.1mm of precipitation. The daily mean temperature is a comfortable 28.7°C with average humidity of 78%. October is the last month of the rainy season, with an average of 17 rainy days and 198.4 monthly sunshine hours. Loi Krathong, one of Thailand’s most popular festivals, takes place in November. If you’re in Bangkok during Loi Krathong, celebrate in Lumphini Park or beside the Chao Phraya River. In December, Bangkok’s daytime temperatures are cool and comfortable. The mean daytime temperature is 26.9°C, with an average high of 31.7°C. December is one of Bangkok’s least rainy months, with just one rainy day and 263.5 mean monthly sunshine hours. The King’s Birthday (which is also Father’s Day in Thailand) takes place on December 5. The New Year is also a major holiday in Bangkok, with fireworks near Central World Plaza and on the Chao Phraya River attracting large crowds.